Raise your hand if you’ve ever worried about someone “stealing your idea” – and let that worry stop you from doing something. We’ve all done it at one point or another. But except in patent situations and other unusual cases, those worries are usually unfounded. Worse, they can hurt us as writers. Be careful not to buy into the Big Idea Myth. 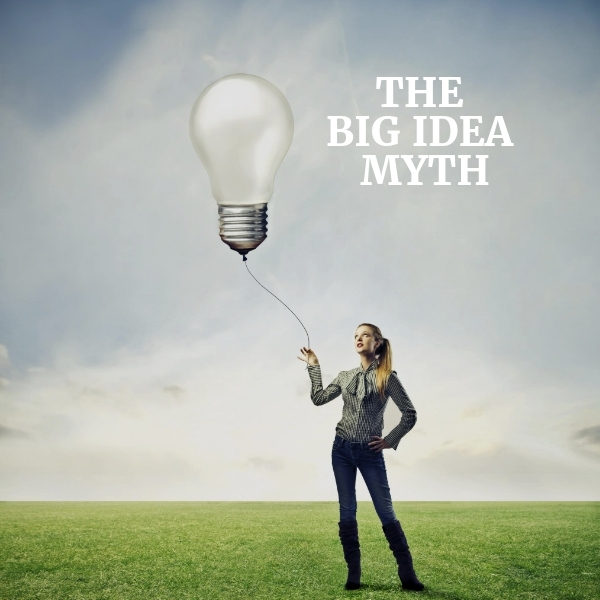 The Big Idea Myth is the belief that for any creative endeavor, the idea counts the most. Execution is trivial. Start-up founders often believe this myth: they come up with a great, no-fail idea for a business. The start-up landscape is littered with the ghosts of businesses built on great ideas. In writing, the Big Idea Myth leas you to believe that the concept is the important part of the project, while effective execution is either trivial or something that anyone can do. Not only is this myth untrue, it’s dangerous. For authors, the Big Idea Myth New impedes publishing and marketing efforts. New authors are protective of the work they have done – or that they plan to do – and don’t want to share their ideas. They hesitate to submit a proposal to an agent or publisher, in fear the publisher will “steal” the great idea. They wait to build their author platform, to keep the idea secret for the “big reveal” of publication day. They don’t reach out and speak with other people in their field (who could be wonderful advocates for their books) because they want to protect and shield their ideas. In protecting your cherished idea from prying eyes, you may well condemn it to languish in obscurity. The Big Idea Myth is dangerous for any type of writing. If you believe in this myth, you might wait to start writing until you have a “golden” idea. For most of us, the ideas only flow when we’re actually working. Worshipping the big idea short-changes the other significant part of creating excellent work: execution. If execution were so easy, the world would be filled with wonderful movies and books. Ideas are abundant. Most stories can be mapped to a finite set of plots. Good ideas aren’t scarce; great execution is. Behind the Big Idea Myth is another fallacy: that ideas are a finite resource, operating by the rules of scarcity. A single idea can be claimed and used up. Good ideas are a multiplying resource. Share them and they grow. The tendency to worship a “big idea” is prevalent in our society. If you work as a writer in an organization with this bias, then people will not value the work you do shaping and crafting content. They’ll toss outlines at you and act surprised if the final result isn’t dazzling. The Big Idea Myth marginalizes the real work of writing. You can attempt to educate those around you about what is involved by making your process more visible. Or you can accept your fate and hope for acknowledgment or recognition from the people who matter in your job. But whatever you do, remember that skillful execution is at least as important as the original idea. And sometimes, execution is the path to bigger and better ideas. This is one of the common writing myths discussed in The Workplace Writer’s Process: A Guide to Getting the Job Done.